The Sun is a card of victory, achievement and joy. Playful smiling children, sun flowers, radiance are the imagery associated with this card. 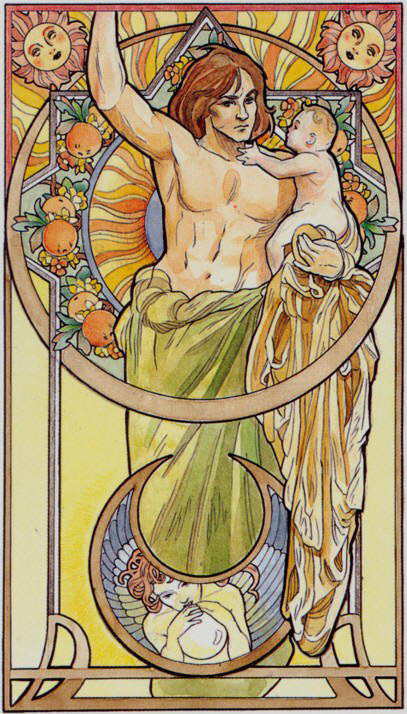 Below you can view the various artistic interpretations of the The Sun card. It�s a great shout of love. It�s a dance on the beach basking in the glow. It�s the voice of your talent. A song poured from the heart. It�s transformation of pain into art. The Sun shines without prejudice. The colors of the world are vivified. Its' light equals enlightenment, omniscience. The heat of the sun is a symbol of expressiveness and expansiveness. The baby represents the birth of true compassion. Thus daily my crazy old guru did sum. Yum is the relish for life at its best, a hunger for love, a joyful ingest. But, yuck is denial, a firm turn away, with mouth clamped tight and nothing to say. Well��. Turn around, spin around, my choice is yum! Is the Sun rising for you? Do you want to �give something back�? Are you allowing your talents to radiate?